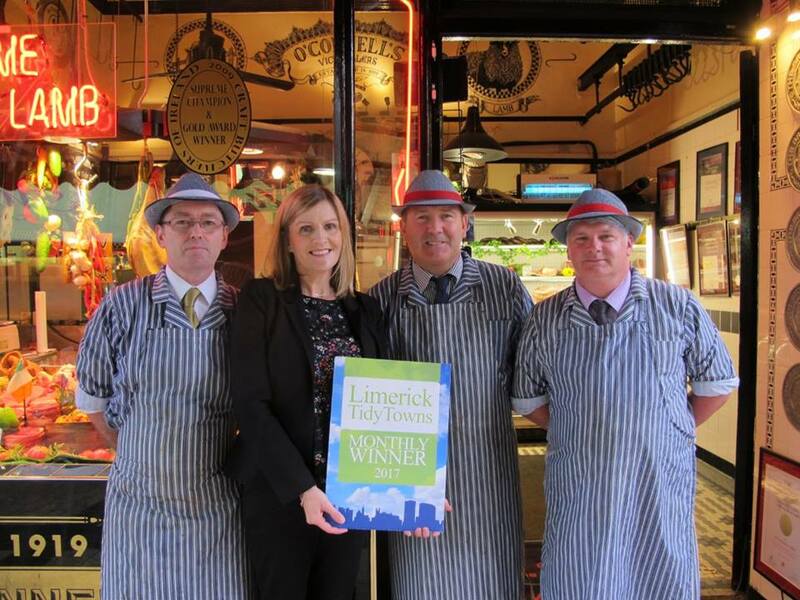 The Limerick City Tidy Towns monthly award for August 2017 has gone to O’Connell Butchers on Little Catherine Street for their beautifully maintained traditional butcher shop, making it two awards in a week for the renowned Limerick Butchers who also reached the final stages of the prestigious Blas Na h-Eireann awards due to take place in Dingle in September, for their dried cured smoked pork belly. 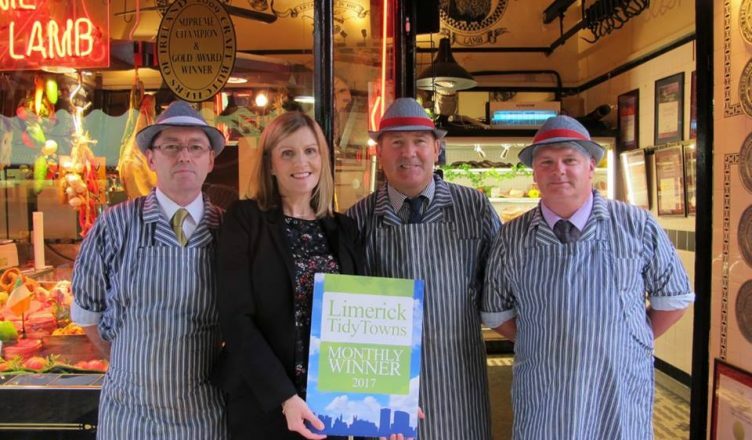 Given that there were over two and a half thousand entries, this is a remarkable achievement for both O’Connell’s Butchers and Limerick city and we wish them every success in the final. We have long admired the O’Connell’s Butchers unit on this lovely pedestrianised street in the heart of the city, but having already given an award to a nearby unit in 2016, we waited until 2017 to give them this well-deserved recognition. O’Connell’s Butchers has long been renowned throughout Limerick not only for the quality of its produce, but also for its striking and immaculately kept exterior, beautiful traditional signage and consistently head-turning window displays, matched only by the delicious smells emanating from the shop. The unit was also suggested to us as a potential award winner by a member of the public and a regular customer of O’Connells, so it’s great to see that their hard work doesn’t go unnoticed by all who shop there. O’Connell’s Butchers is the eighth Limerick City Tidy Towns monthly award winner for 2017, following The White House Bar in July, Bluebird Care in June, Enzo’s in May, Billy Higgins Clothing in April, No 1 Pery Square in March, Casey’s Londis Mount Kennett in February and Narrative 4 in January, and all monthly winners will be in with the chance of winning the overall prize for 2017 at the annual Tidy Towns event to be held early in 2018. Keanes Jewellers win the final 2018 award. Copyright © 2019 Limerick City Tidy Town.